1 Due to the intrusion of the left rear door during the side impact test, the interior door panel struck the torso of the rear passenger dummy, causing a high lower spine acceleration. High lower spine accelerations, in excess of 82 g's, indicate a higher likelihood of thoracic injury. 2013 Ford Fiesta 4-door hatchback Good performance in front, side, rear and rollover tests. 1 — Applies only to models built after Aug 2013. 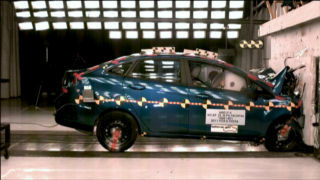 2013 Ford Fiesta 4-door sedan Good performance in front, side, rear and rollover tests.